A 35 year-old man was assaulted 4 weeks earlier with a blunt object over his right temporal region. At the time of the injury, there was no loss of consciousness or ocular injury. However, over the next few weeks, he exprienced progressive swelling and redness of the right eye. There was no medical history of note. 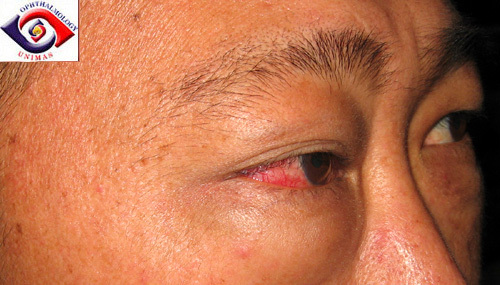 On examination, the right eye (Figure 1 and 2) was noted to be red with moderate non-axial proptosis (confirmed on Hertel's exophthalmometer and measured 20mm in the right eye and 15 mm in the left eye). 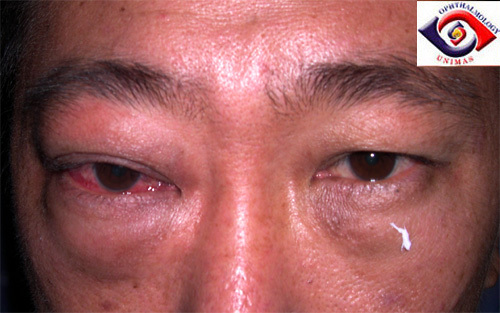 The right conjunctiva showed dilated vessels (Figure 3). The visual acuity measured 6/12 in the right eye and 6/6 in the left eye. The intraocular pressures measured 40 in the right eye and 18 in the left eye. 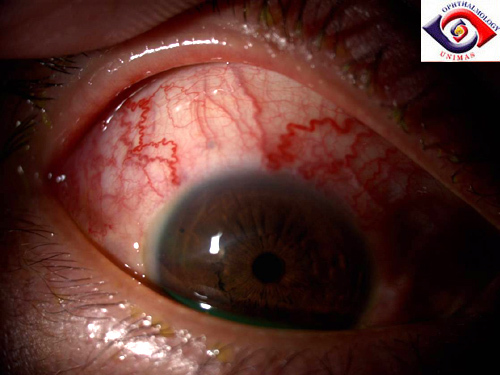 Gonioscopy showed blood in the right trabecular meshwork (Figure 4). Fundoscopy showed no optic disc or retina abnormalities. The proptosis is non-tender to palpation. Bruit can be heard with the bell of a stethoscope when the eye was closed. Figure 1. 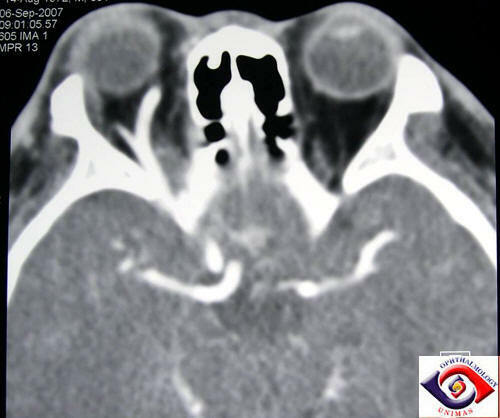 Side view showing right proptosis and dilated conjunctival vessels. Figure 2. 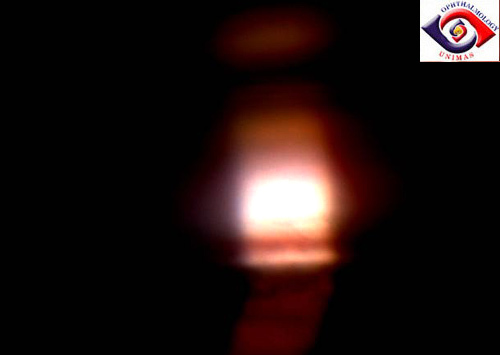 Frontal view showing right non-axial proptosis. Figure 3. Dilated cork-screw vessels. normal because of the blood. He was started on topical latanoprost and timolol but the pressure remained high at 35mmHg. Oral acetazolamide 500mg b.d. was added and this brought the pressure down to 25mmHg. 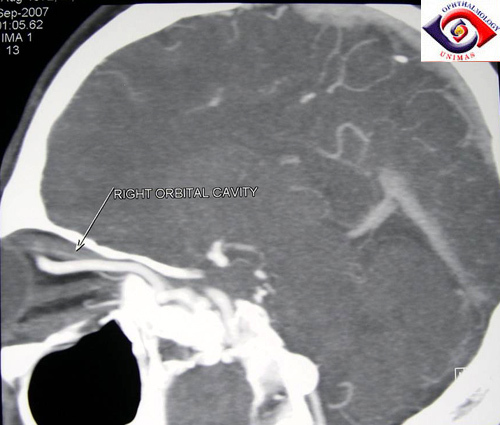 CT angiograms were as shown below (Figure 4 and 5) and the patient was referred to the neurosurgeon for co-management. Figure 5. Axial CT angiogram view of the orbit and brain. Figure 6. Saggital CT angiogram. a. What do the CT angiograms show? What is the most likely diagnosis? b. What are the mechanisms of raised intraocular pressure in this condition? c. What are the treatment modalities for this condition? e. What is the natural history of this condition?